GREEN CREATIVE, the commercial grade LED lighting manufacturer announces the selection of 8 products by the Illuminating Engineering Society (IES) for the 2017 Progress Report. 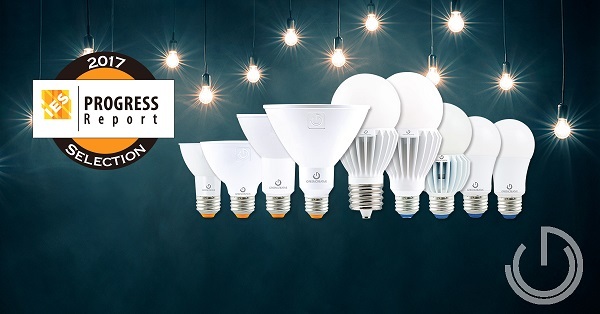 These high-performance LED lamps replace a combination of incandescent, halogen and HID light sources. The Progress Committee’s mission is to keep in touch with developments in the art and science of lighting throughout the world and prepare a yearly report of achievements for the Society. Acceptance is based on an impartial judging process used by the committee to evaluate each submission on its uniqueness, innovation and significance to the lighting industry. Accepted products will appear in this month’s issue of LD+A magazine. A digital version of the report is already available. Among the 8 products selected for the 2017 Progress Report are the REFINE Series PAR38 17W, PAR30 and PAR30SN 13W and PAR20 8W lamps. Each ENERGY STAR® certified lamp features the full-faced, patented REFINE optic and provides industry leading lumen output, candela and efficacy. All lamps come standard in CRI 90, are enclosed fixture rated, last 50,000 hours and are available in spot, narrow flood and flood beam angles. PAR38 and PAR30 277V versions are also available. Joining the PAR REFINE Series in the 2017 Progress Report are the A19 10W and A21 14W lamps. With traditional A19/A21 form factors, these enclosed rated lamps have the highest efficacy among all other 75W and 100W replacements. The A21 14W will be available in early 2018. This year GREEN CREATIVE saw its first HID replacements accepted into the Progress Report with its HID LED 16.5W and 25W products. The ENERGY STAR certified HID LED 16.5W replaces 50-70W HID lamps, emits 2000lm and has an industry leading efficacy of 121 LPW. The HID LED 25W (E26 and EX39 versions) lamp is the first product to utilize a compact A-lamp form factor to replace 70-100W HID lamps. This innovative lamp comes in E26 and EX39 versions and emits over 3300 lumens. Both HID LED products run on 120-277V universal voltages and are ideal for use in bollard, post top and some low bay applications.